In June, my parents and I spent a few days in San Sebastián. Also called Donostia, the city on the Bay of Biscay is definitely the most elegant place I’ve ever been. Tucked in between rolling green hills and a sweeping seaside, It’s famous for being a foodie heaven and a glamorous film festival location, but there’s much more to the city too. 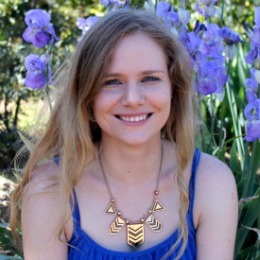 For somebody who isn’t religious, this is the second time I’ve mentioned Jesus on my blog recently, so it must be for a good reason! 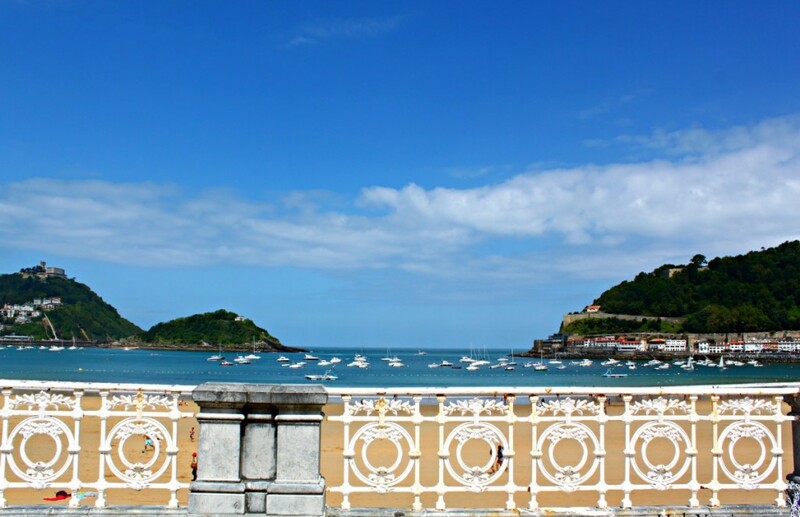 San Sebastián has a beautiful park overlooking the sea right behind the old quarter. Right on top is a huge Jesus statue and an old fortress. Walking up there is absolutely lovely at sunset, and as it gets darker it seemed to be quite a fabulous spot for a botellón as well. (I didn’t personally partake, as I was with my parents, but it looked great!). Even after having lived in Spain for over 2 years, the “ciudad vieja” will never get, well, old for me. Walking through old winding streets gives me a feeling that there’s always something unexpected and beautiful just waiting around the corner – and a lot of the time, that actually happens. San Sebastian’s old quarter is tucked away between the bay and a fancy shopping district, so we easily spent a whole afternoon walking around this lovely little area. I’d seen one of Chillada’s other pieces in Gijón, Asturias and was pretty impressed, and the Comb of the Wind was equally as cool. 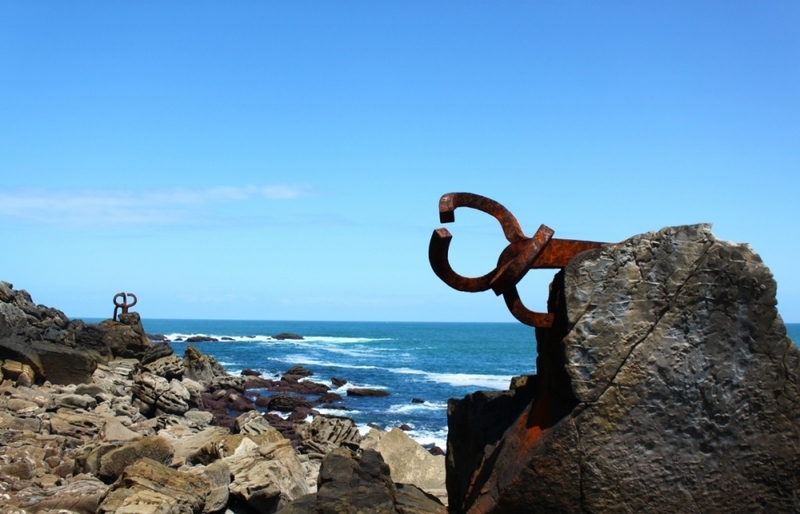 It’s made up of three big sculptural pieces built into the rocks on the coastline at the edge of the bay. The best way to enjoy this sculpture is to sit on the seawall, relax, and enjoy the sound of the wind whistling by and the waves crashing on the rocks. Ahh! 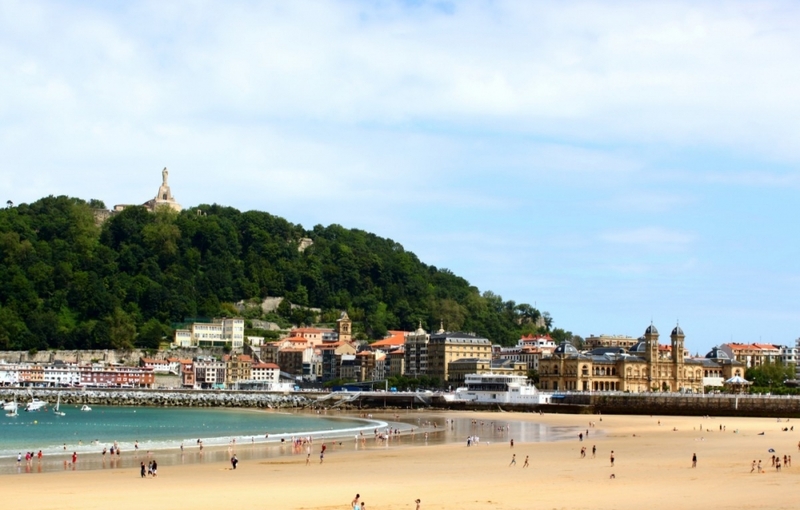 The most outstanding feature of San Sebastián is definitely its beautiful seaside. The pretty white railing running along the promenade adds an elegant touch. Barcelona’s city beaches this is definitely not (much as I love them!). Even in the height of summer, the San Sebastián beach wasn’t stuffed to bursting with people, so and you could lie back and enjoy the curving bay view in peace. Whether you fancy a gentle stroll or a day of sunbathing on the beach, I haven’t seen a prettier city beach ever. 1) Try the “txikiteo” – a.k.a. eat! I’m definitely not a foodie by any means, but even I was super impressed with the food in San Sebastián. The local speciality is pintxos (also spelled pinchos), tiny servings of delicious dishes served on top of small pieces of bread. Usually, these are held together with toothpicks. At the end of the meal, you leave the toothpicks on your plate and the bartender counts them up. Most places I went made you actually show them what pintxos you’d taken to make sure you didn’t engage in the other pintxos “tradition” – hiding the toothpicks up your sleeve! (This may only be a tradition among certain of my friends when we go out for pintxos, but I would not be surprised to find out it’s more widespread). The best part about pintxos is you get to pull the little plates of whatever strikes your fancy off the bar directly. You can also order hot ones. I loved being able to see all the options laid out in front of you, plus the chance to try lots of different types of food. I probably wouldn’t ordered the vinegary fresh tuna, green pepper, and onion pintxo off a paper menu, but it was one of my favorite bites of the night. 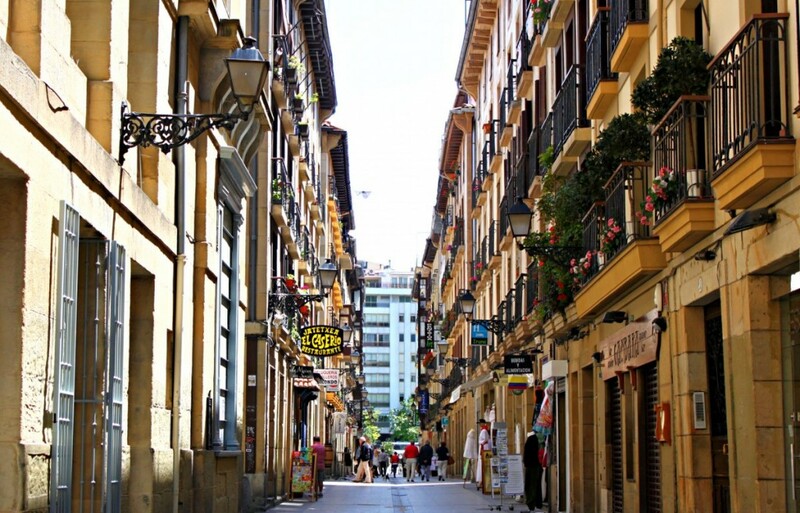 If you’ve been to San Sebastián, what other great things are there to do in the city? They’re both good ones! And they’re both much greener than anything I expected to see in Spain outside of Galicia. My most vivid memory of San Sebastian from a trip many years ago is of the rickety old wooden train we rode in on from our outpost in France – we (a dozen starving students) arrived in the nick of time at our transfer point and we ran to the platform as the train pulled out, tossed our bags on board, and climbed through the nearest open door or window as the train squeaked and creaked its way out of the station. It sound really cool! I hope it is, because that sounds like such an adventure. 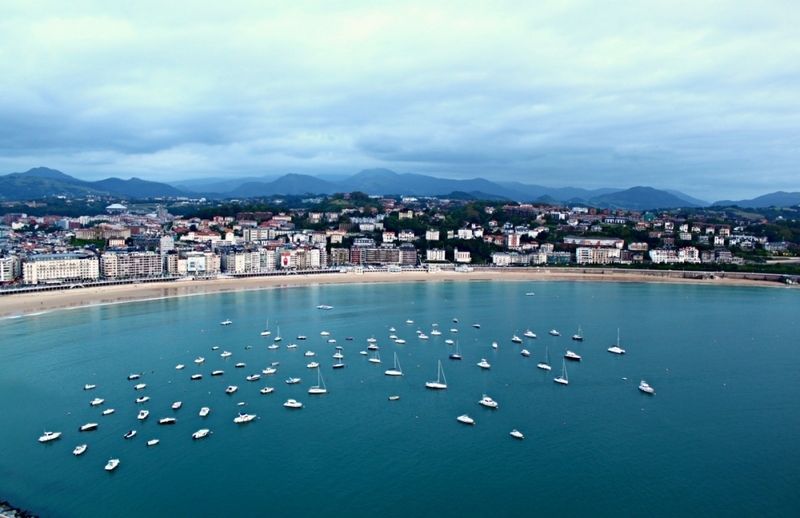 I lived in San Sebastian for a year and it really is an awesome city. It could be one of my favorite cities in Europe. 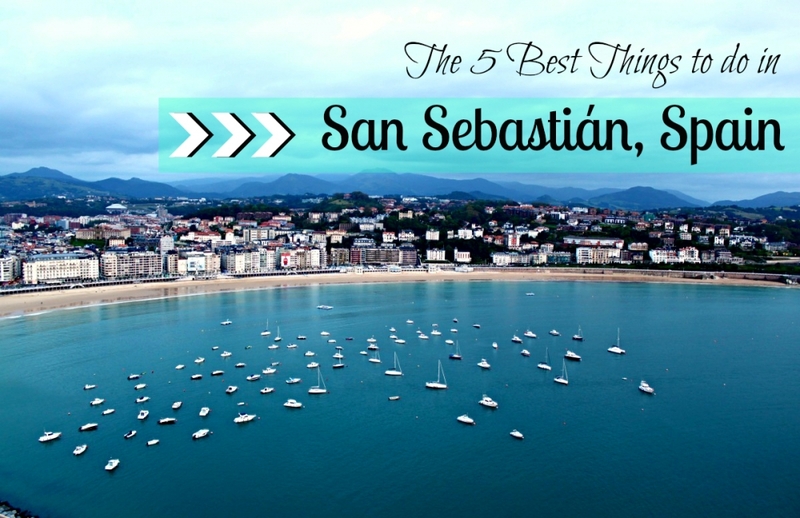 I like your top 5 list of things to do in San Sebastian. As for me.. my favorite was just walking around and seeing the beautiful buildings and beaches. It never got old. Yeah, cities with beaches are always a hit in my book! This is great! I was there in June, too, but it was early June – we had to wear jackets! It still didn’t manage to ruin the trip, though. We did everything on your list and still have plenty of time left over to hang out. San Sebastian is beautiful. Thanks! I was there in late June and I still had a thin jacket on (but I am a big baby when it comes to the cold). It is such a pretty place. Ooooh… I didn’t go to the Jesus sculpture. Another thing you could do is see the Kursaal Auditorium by night!!! Me too, it was so relaxing sitting and listening to the sea there! You should go see his other piece in Gijón if you get the chance, it’s very cool too. I never made it to the Jesus statue but did take the funicular up for the view, 2x. Thanks! La Perla’s heated pools sounds awfully nice, I wish I’d known about that before. There is a cool unknown little shop in Fermin Calbeton in the old part of San Sebastian called Let’s get Basque! You can dress up in traditional Basque costumes and have your picture taken. It is a lot of fun and the owners are extremely welcoming and nice and gave us some cider to try and speak insanely many languages. It is pretty cheap too. Too bad it is not in your list…yet, they deserve a little more attention. Oh that sounds like fun! I hadn’t even heard of it, but next time I go to San Sebastián it sounds like I may have to make a stop. 🙂 Thanks for the suggestion! 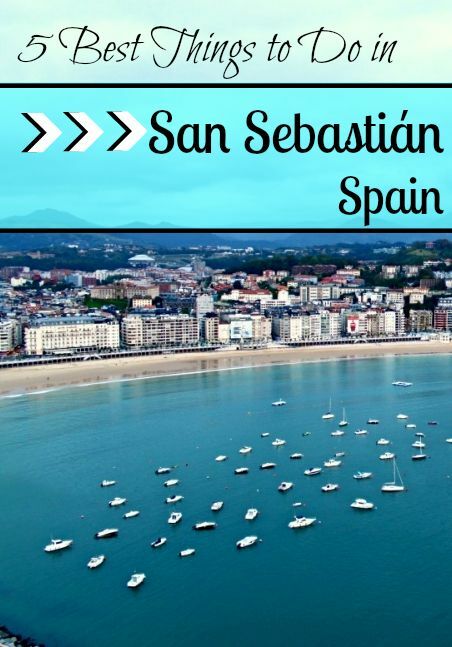 Ooh very glad I just spotted this post, as I’m going to be spending my birthday next month in San Sebastian so have keeping an eye out for things to do! Thanks Jess! Oh have fun! It’s a really lovely city. Have a great time celebrating there! 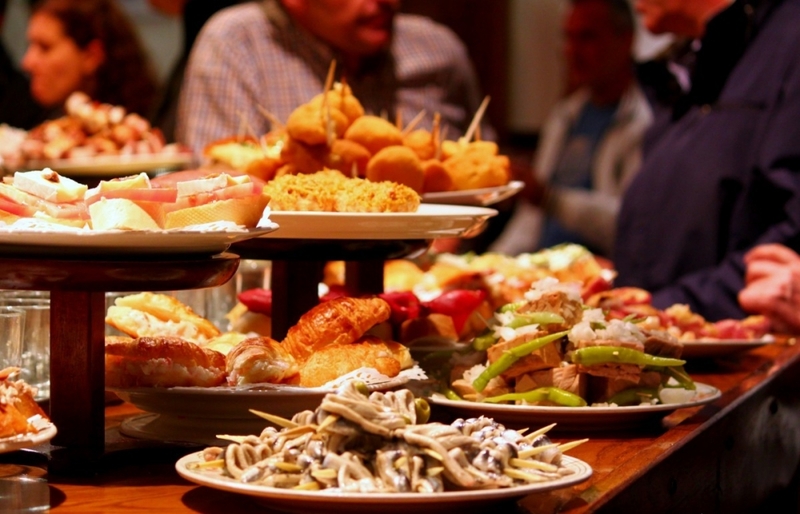 basque country is the best place of Spain to enjoy food. For them, the gastronomy is a way of living. I agree! Spain in general has really good food, but the Basque Country’s cuisine is really incredible. I totally want to eat my way around San Sebastian. The gorgeous scenery is just the icing on the cake! I was soooo full when I got back from San Sebastián! It’s probably the city with the best food that I’ve been to.